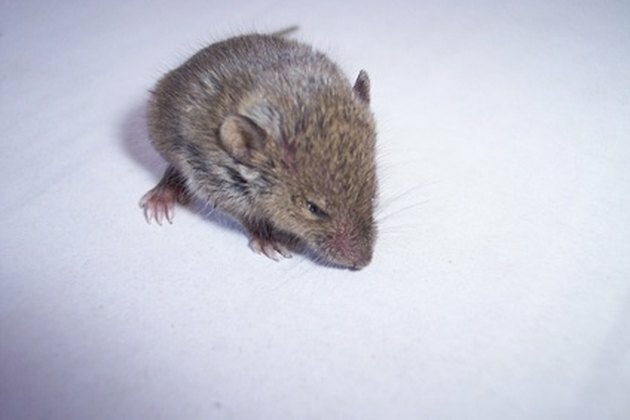 Mice dropping are not only unsightly, they can pose a serious health threat since some mice can shed the deadly hantavirus in their urine, droppings and saliva. Hantavirus can cause hantavirus pulmonary syndrome (HPS) in humans, an often fatal disease. According to the National Center for Infectious Diseases, hantavirus is spread when the virus is inhaled by humans. Handling dried, infected material causes the virus to become airborne where it can be inhaled. Mouse droppings can contain a deadly virus. Put on gloves and a face mask. The CDC recommends using rubber, latex, vinyl or nitrile gloves. Pour 1 1/2 cups of household bleach into 1 gallon of water to create a hypochlorite solution. Thoroughly wet the infected fabric with the disinfecting solution. If the fabric is not color-safe, you can wash clothing and stuffed animals in a washing machine with detergent. To disinfect fabric on furniture, use a commercial-grade steam cleaner or shampoo. Remove solid mouse droppings that have been thoroughly soaked with the disinfecting solution with a damp towel, and mop or sponge the area with more disinfectant. Disinfect gloves with soap and water before removing. Double-bag gloves and mouse droppings and discard into an appropriate waste disposal system. Dry clothes or stuffed animals in a clothes dryer after washing.